The alternative to the purebred or crossbred cattle herd is to manage a mixed cattle breeding program. In this scenario you simply add whatever genetics to your herd as you see fit and pick the best offspring to use as replacement heifers. From a farm management perspective, managing a mixed breed cattle herd is pretty simple. You can produce your own replacement heifers, buy whichever bulls you like, and run all your cattle as a single herd. But there is no such thing as a consistent genetic breed ratio in a mixed breed herd. The individual cattle in your herd will have widely varying traits, body sizes, growth rates, and environmental adaptations, which does limit some of your options when it comes time to market your cattle. The genetic randomness of a mixed breed herd creates a lot of inconsistency in the calf crop. For example, with a mix of both Simmental and Angus genetics, some calves will finish growing and be ready to slaughter by 1050 lbs at around 16 months of age (similar to a purebred Angus). These smaller-framed cattle will likely be slaughter-ready before reaching their second winter. By contrast, others will take after their Simmental lineage and finish at approximately 1400 lbs, around 24 months of age, and will need to be carried through a second winter to achieve that extra growth. And the majority will be somewhere, anywhere, in between. If your simply have a cow/calf program and your calves will be sold to feedlot buyers long before they are finished for slaughter, the genetic variability of a mixed breed herd isn't a huge issue. But if you plan on direct marketing your own beef, good luck planning a predictable and consistent slaughter schedule and grazing program around a mixed breed herd…! And since you're never sure exactly how long all your mixed breed beef animals will need to stay on the farm before they are ready for slaughter or how many of your beef animals will need to be carried over a second winter, it makes grazing planning and winter feed budgets extremely challenging. Which option is right for your farm? If you plan on marketing unfinished calves (weanlings or yearlings) through the commodity auction markets, then you don’t need to worry about consistent frame sizes and finishing time periods in your cattle herd - the feedlot buyers will sort the calves into appropriate groups. Thus, there is no particular marketing advantage to using a purebred or terminal cross versus a mixed breed herd. In cold climates where winter feeding makes up the largest cost to produce beef, it makes sense to use a very consistent cattle herd so that feed costs are more predictable. Thus, purebred and terminal crosses have a slight advantage over mixed breed herds. 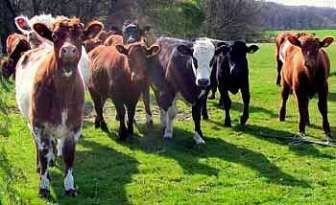 Mixed breed and crossbred herds have an advantage in hot climates in that they allow you to combine desirable traits from multiple breeds, such as the heat tolerance and parasite resistance of tropical breeds with the more sought-after meat characteristics of the British and Continental cattle breeds. Herds that produce their own replacement breeding stock should not bother with a terminal cross breeding program. Producing your own purebred (or black baldy) replacement heifers for a terminal cross herd requires maintaining two separate herds - the terminal cross herd and the purebred herd from which you plan on drawing your replacement animals. This adds so much extra complexity to both your herd management and your grazing planning that it completely cancels out the benefits of using a terminal cross. Furthermore, the purebred herd has to produce enough high quality replacement heifers to supply replacement breeding stock for both the purebred and the larger terminal cross herd. And that’s a pretty tall order. A herd stays productive by only allowing the absolute top-notch individuals to rebreed. But if one herd has to produce enough replacement genetics for two herds, then the genetic bar has to be set a lot lower to get enough replacement animals. That means allowing some mediocre genetics to slip through, which will lead to increased calving difficulties, reduced weight gains in the calves, reduced fertility rates in the cow herd and reduced feed conversion efficiency. Stick to either purebred or mixed breed herds. You get more bang for your buck by simplifying and fine-tuning your grazing management, perfecting your herd culling practices, and honing your winter grazing skills. On the other hand, some producers find it cost effective to buy their replacement heifers from other cattle producers rather than to produce their own. In that case, if you are confident that you have a consistent long-term supply of replacement heifers from other farmers, you definitely should consider buying purebred heifers which you can crossbreed to produce terminal cross calves to take advantage of their hybrid vigor. Or if you can find a good source of black baldy replacement heifers, you could use these terminal cross replacement heifers (i.e. black baldies) as the high-efficient engine that drives your beef production program. The extra hybrid vigor of the terminal cross calves (or the hybrid vigor of your purchased black baldy replacement heifers) will help offset the higher cost of buying replacement heifers rather than raising your own. But be very cautious of this strategy - you need a very reliable long-term supply of high-quality replacement heifers. And beware of breeders selling you replacement heifers AFTER they have already picked off the best heifers to keep for their own herds. Buying replacement heifers from off-farm can easily become a recipe for unintentionally introducing sub-fertile problem-prone genetics into your cattle herd. Smaller farms who finish their own beef (either in their own small feedlots or on pasture for the grass fed beef market), are best served by the consistency and uniformity of purebred or terminal cross cattle. This makes grazing planning, finishing time-frames, and beef products more predictable, simple, and consistent. A mixed breeding program in which calves have highly variable finishing times and body sizes may actually be a benefit to large beef producers which are trying to direct market their beef to a wider range of markets requiring a year-round rather than a seasonal beef supply. This spreads out their fresh beef supply over a much longer time-period without having to store frozen beef. Marketing strategy plays a huge role in whether the uniformity of purebred and crossbred cattle or the greater range in finishing time-frames of a mixed breed herd is more appropriate. If you plan on grass-finishing your own cattle in a strongly seasonal climate, then the consistent sizes and growth rates of a purebred or terminal cross program are a big advantage because they let you plan for consistent slaughter dates. A mixed breed herd combining two very similar-sized breeds would also work. Furthermore, if you want to slaughter prior to the second winter (and not carry the meat animals through another winter on expensive winter feed), pick a fast growing, smaller-sized, lighter-weight breed or breed combination that can predictably be finished and slaughtered prior to their second winter. Climates that are not very seasonal (where year-round grazing is possible) don’t suffer the disadvantages of high winter feed costs since the cattle never run out of pasture. In this case a mixed breeding program won’t throw your winter feeding costs out of budget and may actually give you a marketing advantage by extending the season over which you can supply fresh beef without needing to resort to storing frozen beef. Mixing and matching multiple breeds can make your life a lot more complicated. While breed choice is vital to ensuring that your cattle match your climate and production strategy, don’t forget that this is just a single puzzle piece of a much larger puzzle. Keep your herd management simple so you can truly optimize your grazing program. That will give you a lot more bang for your buck than trying to chase after exotic breed combinations or over-complicating your herd management to create the “perfect” terminal cross. Have a look at the largest commercial cattle herds - the ranchers that run tens of thousands of cattle. They have the luxury of volume, which would allow them to create all sorts of fancy terminal crosses. They don’t. They keep it simple. Most use either mixed breed herds or purebred herds, depending on their climate and marketing strategy, and instead put their efforts into maximizing the efficiency of their grazing program. Always opt for whatever solution allows you to minimize the number of separate herds you run on your farm. Always opt for the choice that gives you the best selection of replacement genetics to choose from when you pick the individual replacement heifers for your herd. And always opt for the choice that allows you to create the most consistent beef product to match your marketing strategy. 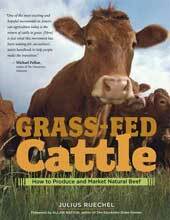 If you'd like to learn more about how to pick the right breed for your beef cattle herd and how to identify the most fertile and most efficient individual cattle genetics when choosing your replacement heifers and bulls, check out my book: Grass-fed Cattle: How to produce and market natural beef. So, will you choose purebred, crossbred, or mixed breed cattle? Do you have a favorite breed or breed combination to match your climate and marketing strategy? Share your thoughts in the comments section below!